Chutes and Ladders in Dragon’s Watch! 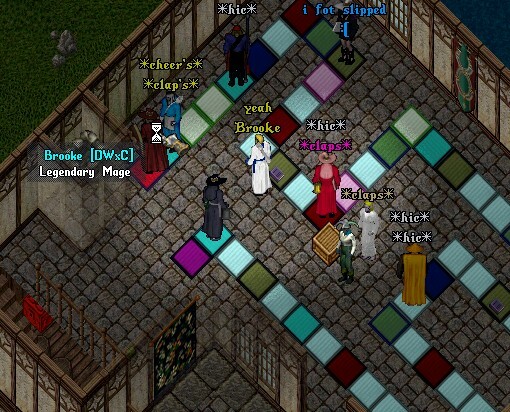 Patrons gathered in the city of PaxOku last eve en route to the Felucca player run city of Dragon’s Watch to take part in anniversary activities hosted by the Paxlair statehood. Lord Nanoc and Lady Phoenix hosted two rounds of adventurous “chutes and ladders” as players traversed the course laid out inside the town tavern. The rounding course, colorfully laid out much like a game board pit player vs player in attempts to be the first to the finish. With treacherous turns and costly pitfalls everywhere the first round went to DWxC’s own Lady Brooke. Round two went much Better! After spending most of my previous attempts in the cellar and stables below, falling down every chute possible this very reporter led the charge to the finish line to win the second game. Both round winners claimed prizes of 500k from the nights host. The group later went on the slay Medusa in several hunts to the depths of the Abyss. 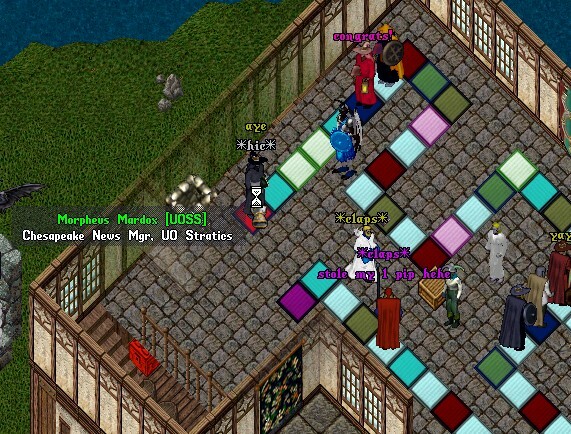 Special thanks to the Paxlair Statehood for the nights fun and join them tonight in PaxOku at the cities “Teahouse” for the Statehood dinner to wrap up the celebratory events marking 16yrs in the realm.